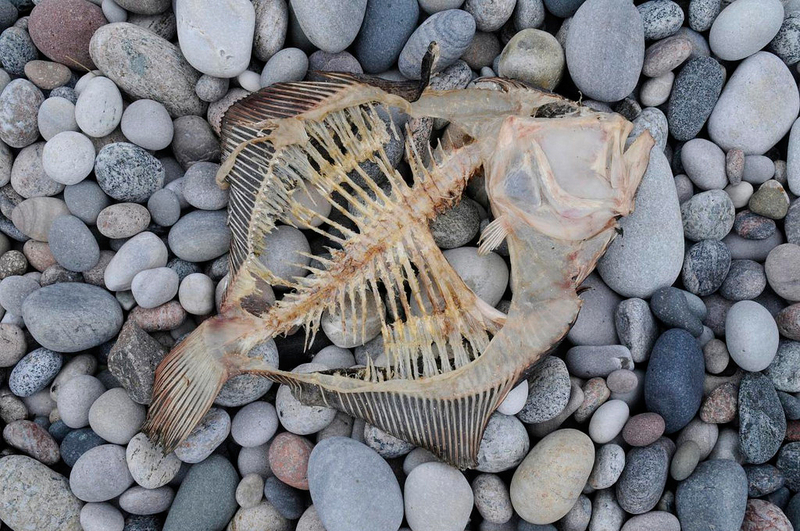 Some flatfish are fished commercially such as sole, flounder, plaice, turbot and halibut. They swim sideways. It hides on an ocean floor resting for prey. It has the ability for dynamic camouflage that is under nervous control and could change in real time. It has some features that suit its lifestyle. It has got both eyes on one side of head meaning upper side; one or other migrates through or around the head during development. Some species face its left sides upward or some has their right sides upward and others face their either side upward. 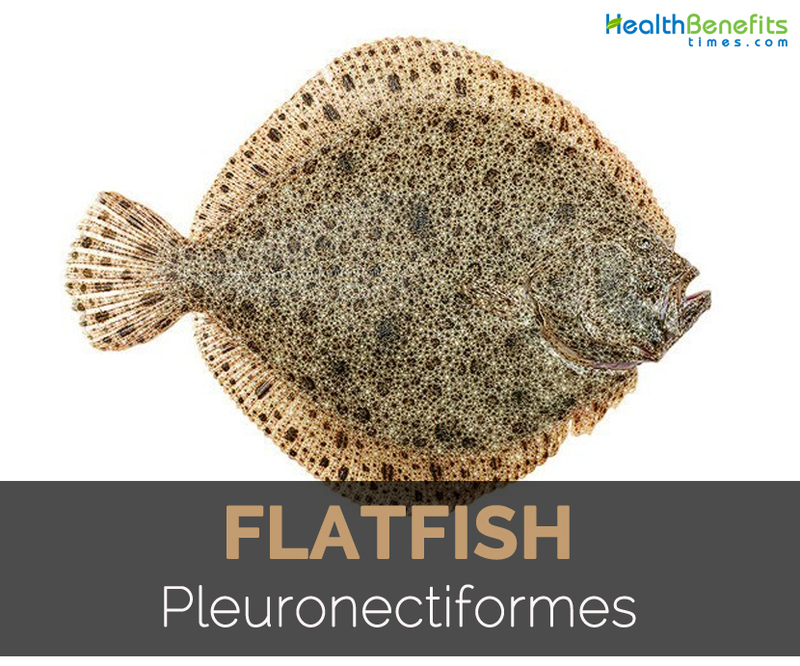 Flatfish belongs to the member of order Pleuronectiformes of ray finned demersal fishes also known as Heterosomata that might be classified sometimes as a suborder Perciformes. 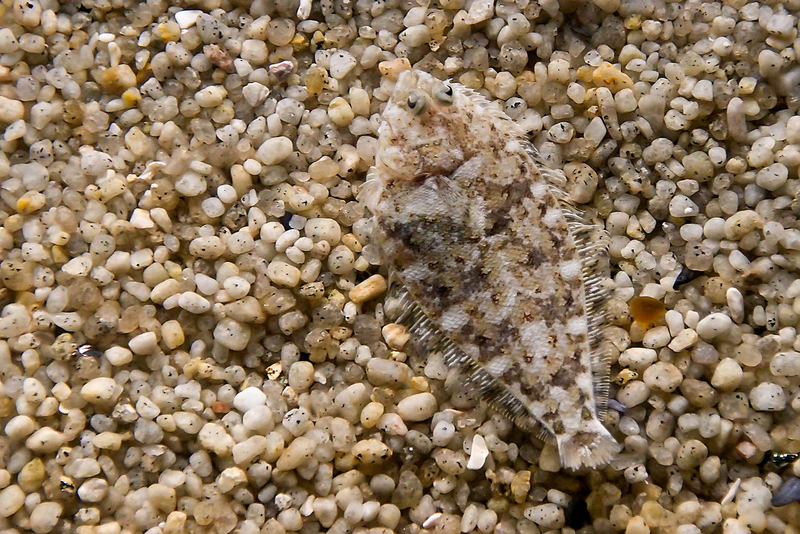 Flatfish could mask themselves by resembling the color of the sea floor. They become patchy stone colored on pebbly bottoms and sand colored on sandy bottoms. These fishes start their lives as normal swimming fish but gets flattened body within some weeks. It is adapted totally to living on sea floor. About 600 species of flatfish are found such as flattened, oval and bony bodies which are found from tropical to cold waters. Some flatfish enter or live in freshwater permanently and most of the species lives at moderate depths along continental shelf. Species could vary from 4 inches to 7 ft. (10 cm to 2 m) long weighing 720 lb (325 kg). They could be divided into three groups: the soles, families Soleidae, Cynoglossidae, and Achiridae; and the flounders, families Achiropsettidate, Citharidae, Bothidae, Pleuronectidae, Paralichthyidae, Scophthalmidae and Samaridae and the spiny turbots, family Psettodidae. American soles are several Atlantic or one Pacific species. It has small close-set eyes with small and twisted mouths having few to no teeth. It prefers warm and shallow water having sandy or muddy bottom and are too small or bony for food. Solea solea is an European species of flatfish that measures 2-ft (61-cm) found from the Mediterranean to the North Sea is a valuable food fish being a source of fillet of sole. They are much larger fishes that includes the halibut (Hippoglossus), fluke ( Paralichthys), the plaice (Pleuronectes) and the dab (Limanda). Flounder (smooth) are found in cold and shallow northern waters on muddy bottoms. Winter flounder (Pseudopleuronectes americanus) is a vital food or game fish which is taken in large numbers by trawlers. It migrates to deeper waters to breed in winter. It belongs to the Pleuronectidae, righteye flounder family. California halibut or California flounder (P. californicus) is the prized sport fish found off California which weighs upto 50 lb (23 kg). Usually flounders feed on worms, small bottom invertebrates and crustaceans. 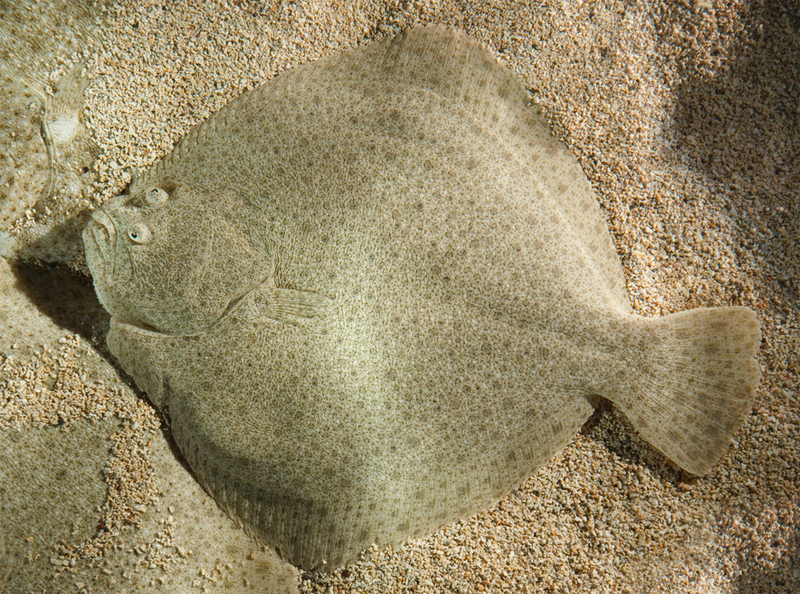 American plaice is commonly found at depths from 20 to 100 fathoms on sandy or muddy bottoms feeding on sand dollars, sea urchins and other bottom life and measures 30 in. (76.2 cm) and 14 lb (6.4 kg). 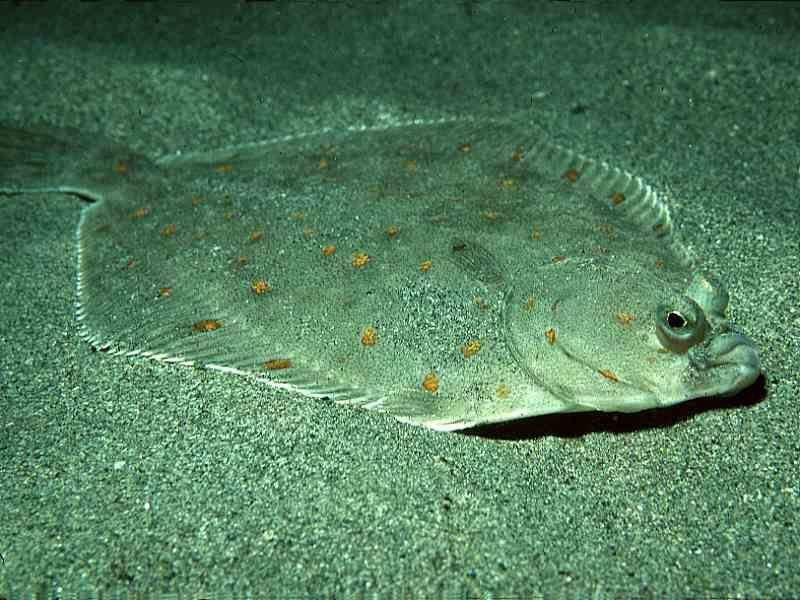 Halibuts are considered to be the largest flatfishes with great commercial importance. The Atlantic halibut (Hippoglossus hippoglossus) and the Pacific halibut (H. stenolepis) are similar having large mouths and sharp or strong teeth. Generally, male is much smaller than female. Flatfish has its irregularity characteristics having both eyes lying on same side of the head in an adult fish. Usually some families have their eyes on right side of the body (dextral or right-eyed flatfish) and others have on left (sinistral or left-eyed flatfish). Other distinguishable features are presence of protrusible eyes, extension of dorsal fin onto head and adaptation to living in seabed. The body side without eyes facing seabed is very pale or colorless usually. Generally, flatfishes are relied on its camouflage to avoid predators. Spiny turbots and flounders have well-developed teeth and consumes smaller fish. Sometimes, it seeks prey in midwater, away from bottom and shows some extreme adaptations in comparison to other families. Soles are bottom dwellers and feeds on invertebrates. 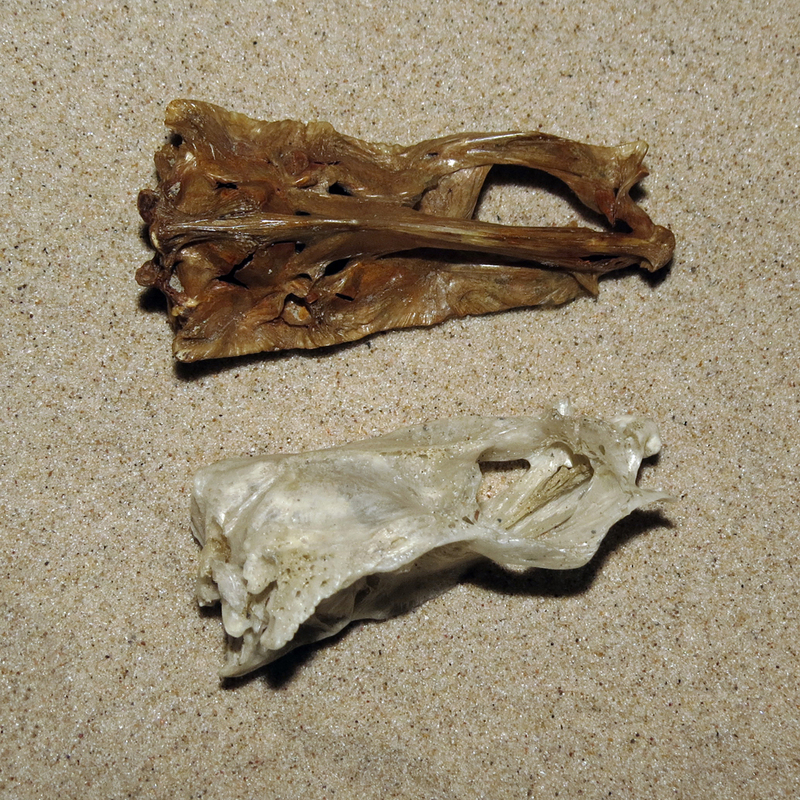 It is more asymmetry and lacks teeth on one side of jaw. Flatfishes measures 4.5 cm (1.8 in) in length weighing 2 g (0.071 oz). They lay eggs which hatch into larvae resembling typical and symmetrical fish. Initially, they are elongated which develops into a more rounded form quickly. Typically, larvae have protective spines on the head, over gills and in the pelvic or pectoral fins. It has swim bladder and do not dwell on the bottom, instead dispersing from their hatching grounds as plankton. 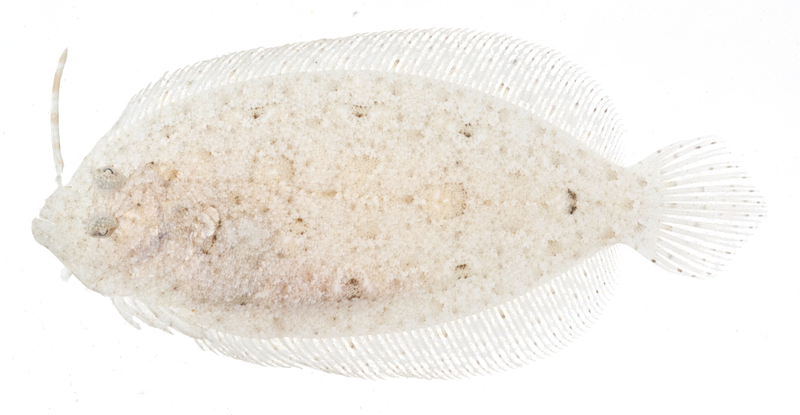 In planktonic stage, length varies between various flatfishes but begins eventually to metamorphose into adult form. One of the eyes shifts across top of the head or onto other side of the body leaving blind on one side. Larva loses its spines or swim bladder and sinks to bottom laying its blind side on underlying surface. 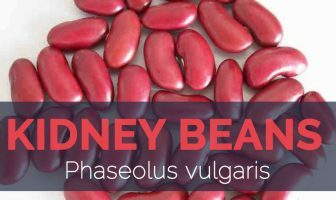 It is considered to be a great source of protein. A cooked portion of 24 grams offers around 200 grams of protein. Men requires higher amount of protein regularly i.e. 56 grams of protein and women requires around 46 grams of protein. One serving grants almost half of daily recommended protein needs. Protein is also required to maintain and repair tissue, muscles and organs in the body. Flounder offers a great source of essential amino acids. Besides this, it has rich amounts of omega-3 fatty acids. A serving of 100 grams of cooked portion is equal to 117 calories that makes it a low energy dense food. It has lower calories in comparison to its weight. The diet with low energy dense foods helps the one to feel full on lower calories and makes it easier to manage weight. Flounder fish has low content of fat such as saturated fat. The fat found in food is considered to be a great source of calories that assist to absorb fat soluble vitamins but too much fat in diet increases the chances of heart associated problems. Besides having low fat or protein, it has also low amount of saturated fat which is considered to be the harmful fat for the body as it promotes blood cholesterol in the body. The promotion of blood cholesterol in the blood forms blockage in heart and limits the flow of blood to and out of the heart. It is recommended that less than 10 percent of calories should be derived from saturated fat. 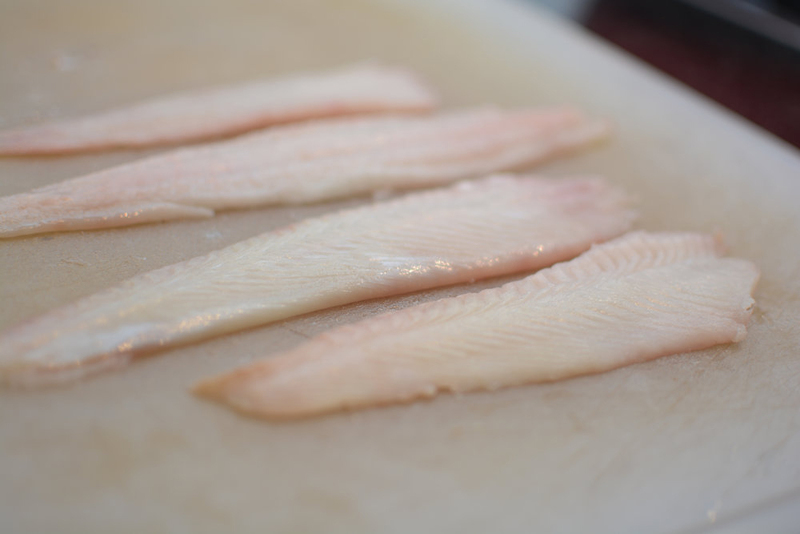 Flounder is a great source of vitamins such as magnesium, Vitamin B and phosphorus. One requires vitamin B to convert food into energy. Vitamin B is essential for red blood cells production that contains hemoglobin. Red blood cells are essential for the flow of oxygen. Being magnesium a mineral, it assist in production of energy, making protein and aiding blood sugar or blood pressure control. However, phosphorus is required for healthy bones and teeth. 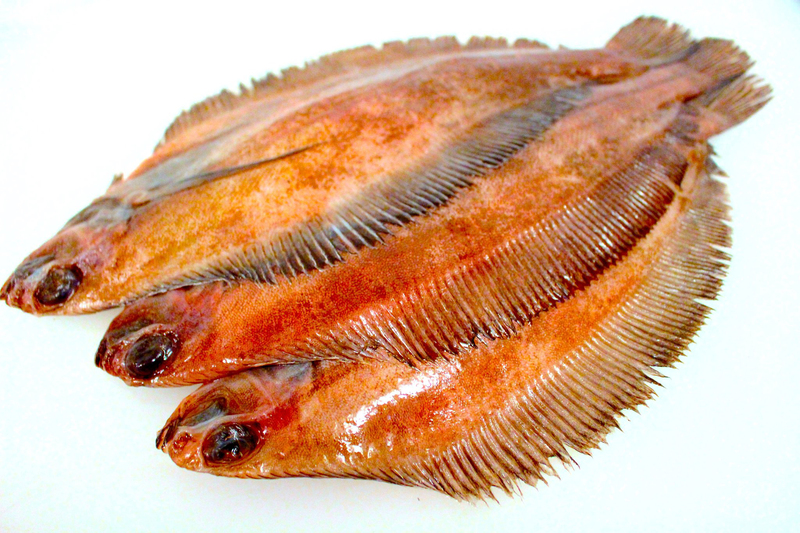 Flounders are rich in omega 3 fatty acid which is essential for pregnant women at early stage. It assist to develop fetus heart, brain and also other vital part or functions of the body especially nerves of the baby during pregnancy. It is required for kids at earliest of age to promote its brain and nerve function. Studies show that the consumption of flounder lowers the chances of depression. Research showed that people who consumed flounder reduces the chances of depression by 17 percent in comparison to those who did not consume. Flounders offer nutrients such as omega-3 fatty acids, vitamins, protein and minerals which are related with lowering the chances of depression. Studies have shown that consumption of fresh seafood such as flounder extend the function of brain nerve as it promotes and normalize flow of blood to the brain. Studies have added that oily fish such as mackerel, salmon, flounder and sardines helps to encounter Alzheimer’s disease. The consumption of fish is found to be helpful for diabetic patients. The consumption of flounder helps to counteract diabetes and also the chances of getting diabetes. Flounder has ample Omega 3 fatty acids that provides anti-inflammatory properties for bone assisting to provide relief from arthritis and also prevent other diseases associated to inflammation such as heart diseases. Omega-3 found in flounder helps to reduce the level of unhealthy blood fats, raise healthy cholesterol, reduce growth of arteries clogging and also reduces blood pressure. Its lean flesh is pan-fried, grilled, deep-fried and baked. Coat fillets in rye flour and sizzle for few minutes in browned butter. Serve it on buttered rye bread with remoulade and lemon. It could be accompanied with potatoes, pickled things such as raw lingonberry jam and cucumber salad. Pair it with steamed vegetables. One should limit its intake. Breastfeeding and pregnant women should consult the doctor before its consumption. Some people might get allergic reactions. So avoid it. It has high chances of contamination. It resembles flat and circular ball having fins circling around. Usually, they are brown in color but could be found in colors such as green, orange, red and blue. Most of the species live in warm and moderate oceans but few could be found in Arctic waters. These demersal fish feeds on bottom of sea bed. It is also known as ambush predators. Spawning occurs during hotter months of the year in flounder species. Its predators are eels, big fish, humans and sharks. Industrial pollution is regarded to decreasing its numbers. Usually females are larger than males. The body color depends on its habitat. It has the ability to change the body color to adapt the color of the environment in 2-8 seconds. 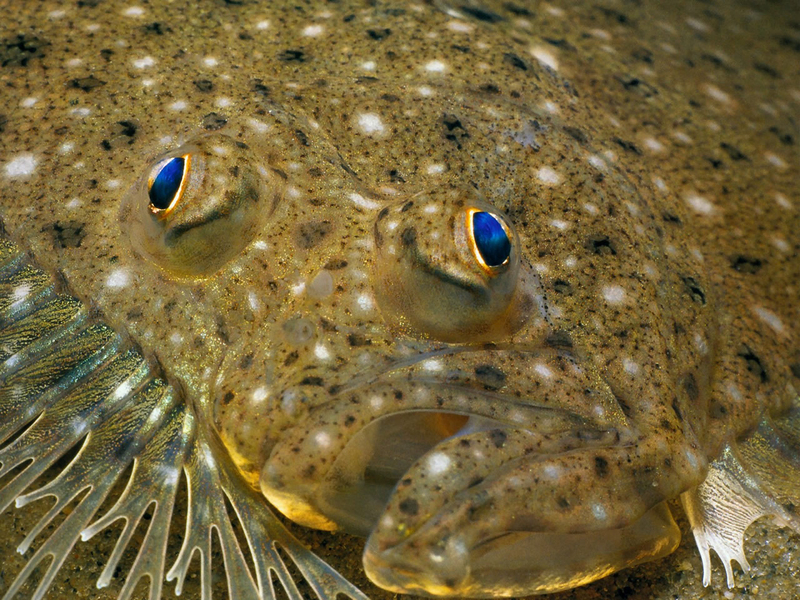 On the basis of an eye position, flounders are divided into two categories: righteye flounders and lefteye flounders. Flounder is a nocturnal animal which means they are active during night. It is motionless and waits for prey to appear and grabs it in a blink of an eye. Usually, eyes are the only visible part of its body. Female lays upto 1,00,000 eggs in water and at the same time male releases sperm cells. After a couple days of hatching, larvae transforms into juvenile fish. Flounder survives from 3-10 years in wild. Calories in 1 fillet (127 g) 109 Kcal. Calories 109 Kcal. Calories from Fat 27.09 Kcal. Calories 114 Kcal. Calories from Fat 28.35 Kcal.